Negotiators of the Iran nuclear deal a few weeks before an agreement was reached. The political debate has begun on the Obama administration’s nuclear deal with Iran, and it is falling almost exactly along partisan lines. Nearly all the Republican presidential candidates are against it (Rand Paul has not issued a statement). Jeb Bush, who is more moderate than most of his fellow Republicans, has already called the deal “appeasement.” All the Democratic candidates are either supportive or noncommittal. In fact, the best predictor of how Americans will feel about the deal, announced Tuesday, is not their position on Iran or nuclear disarmament, but simply their opinion about President Obama. Over the past few months a number of nonpartisan polls have been conducted on a nuclear agreement with Iran. Every single one of them found more support for a deal than opposition. The most recent, a Fox News poll from June, said that 47 percent were in favor of “an agreement that would involve the U.S. easing economic sanctions on Iran for ten years and in return Iran agreeing to stop its nuclear program over that period” compared with 43 percent who were against it. The groups that generally approved of the deal were the same ones that generally approved of the job Obama has been doing as president. Black, Democratic, liberal and younger voters were generally for the deal, while white, Republican, conservative and older voters were more likely to be opposed. 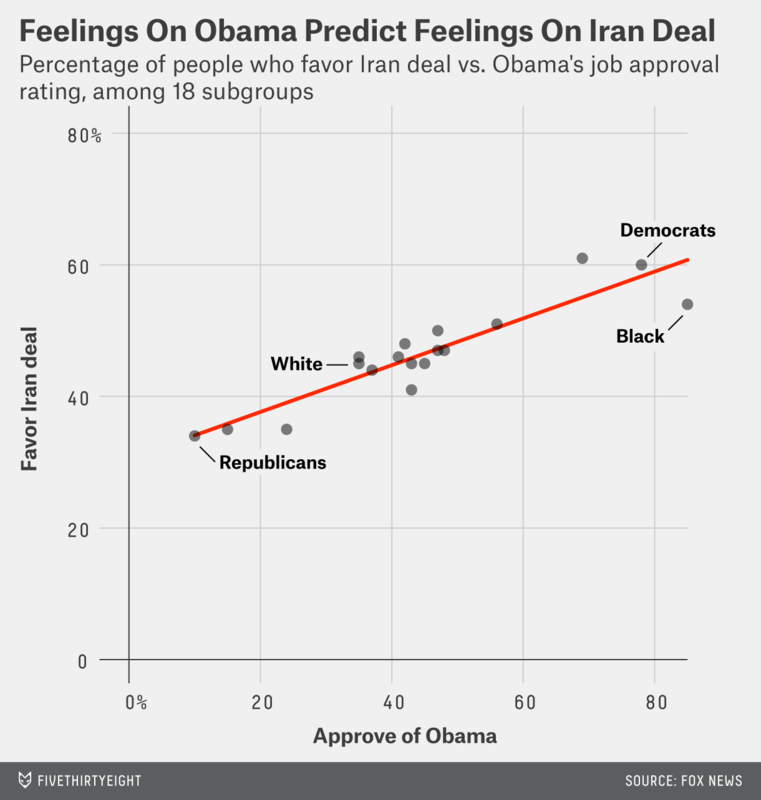 In fact, you can explain 82 percent of the variation in support for the Iran deal in 18 subgroups just by knowing what Obama’s job approval rating was in each group. The matchup isn’t perfect. There are, for example, plenty of Republicans (34 percent) in favor of the deal and plenty of black people (31 percent) against it. But it wouldn’t be surprising if those groups returned to the partisan fold as the debate reaches a climax. The partisanship on display in this issue was also apparent during the gun control debate after the Newtown school massacre in Connecticut. You probably remember how the initial polling seemed to show that there was a lot of support for Obama’s proposals. But once Obama’s name was attached to the legislation, support for any bill lined up almost perfectly with how people felt about members of his administration. A different question asked by Fox News gets at this polarization phenomenon. Fox News asked voters, “how confident are you in the ability of the Obama administration to handle negotiations with Iran on its nuclear program?” Forty-eight percent of Americans said they were at least somewhat confident in the Obama administration, similar to the 47 percent that favored the deal, but the subgroup breakdown was much closer to how Americans felt about Obama overall. Ninety-six percent of the variation in confidence in the Obama administration’s negotiations was explained by approval of Obama’s job performance overall. Within the 18 subgroups, the average difference between Obama’s job approval rating and confidence in the administration’s handling of negotiations was just 3 percentage points. 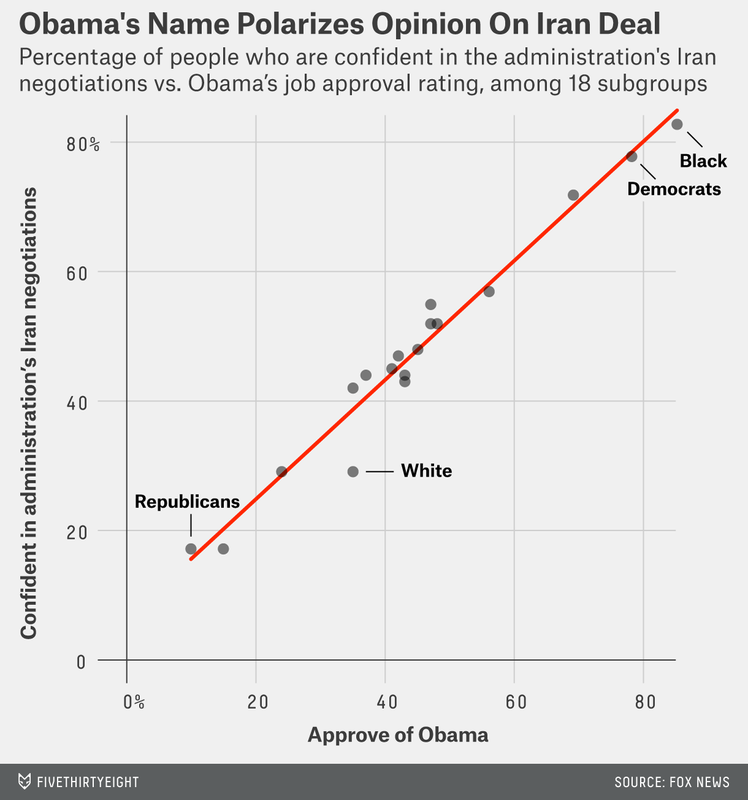 Only 17 percent of Republicans were confident in the negotiations, and just 11 percent of black respondents were not. So what does this mean for the deal as it heads to Congress for approval? On the face of it, it means Democratic voters are probably not going to push for congressional Democrats to stray from the president (except possibly for strong supporters of Israel). That’s not good for the deal’s opponents, who will need bipartisan support to overturn the Iran agreement in Congress (which requires a two-thirds majority). But it also means the White House will not be able to claim a political consensus for one of its most significant foreign policy achievements.